SOS Clothes LTD have been part of the Tree of Hope team for nearly a decade now. They distribute charity bags and collect unwanted clothes nationwide (including Scotland and Wales) on our behalf. The collections are licenced in specific areas all over the UK, which are issued by the Councils so look out for them through your door – They look like the picture above! What can you donate in the bags? Good condition reusable clothing, paired shoes/footwear, fashion accessories (handbags, hats, scarves, belts, light jewellery), bric-a-brac (small ornaments, unwanted gifts, souvenirs), soft toys, toiletries/perfumes (even if partially used), bed linen, towels. How to spot a bogus collection bag? The use of printed plastic collection bags used to be an indication that the collector was likely to be genuine. However, bags are now cheap to produce – and bogus collectors are using them, so this is a poor guide as to whether they’re genuine or not, but if the quality of the print isn’t sharp or the bag is displaying a dated logo or design (for example) this may indicate that the bag isn’t genuine. Other warning signs to look out for: Wording, poor spelling, similar charity name (eg. Trees of Hope), punctuation or grammar mistakes usually make it more likely that the bag isn’t genuine. 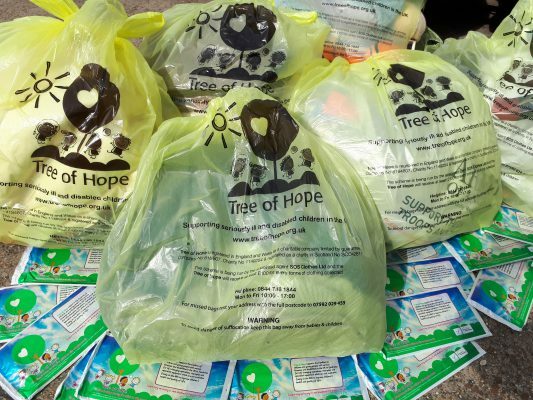 Tree of Hope does not use paper leaflets so if you ever receive a paper leaflet this is most likely from a bogus collector. If you are ever in doubt about the legitimacy of a charity bag or of a collection that is taking place in your area always contact the charity directly to verify this. How much do SOS Clothes raise each year for Tree of Hope? SOS Clothes raise an incredible £40,000 per year that comes directly into Tree of Hope to enable us to support more and more families. Throughout our 25th year, we are encouraging supporters to collect 25 bags from friends, families, neighbours and colleagues to help us raise funds. Why not contact Sam at sam@sosclothes.co.uk to check we can collect in your area and let the clear out begin! Similarly, if you have any question, queries, or would like to organise a collection please contact Sam sam@sosclothes.co.uk or via 01708 685073.